When I woke up this morning and it was only 72 degrees, I knew that the slight nip in the air could only mean one thing. It’s almost hockey season. 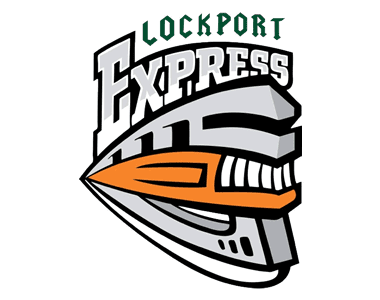 This morning at the Cornerstone CFCU Ice Arena in downtown Lockport, the Lockport Express played a scrimmage against NA3HL rival, Southern Tier Express. Southern Tier players hit the ice first in their yellow sweaters, while Lockport hit the ice a couple ticks later in their practice jerseys. After two seasons of following the team and learning the numbers of the Lockport players, it took several glances at the roster sheet to figure out who was was on the team. A few players were easy to pick out. Gib Stuart with his blonde, curly mullet flowing from beneath his helmet, Andrew Logar wearing his familiar #23, and Josh Evoy in a plain, white #15. By no means could this be construed as a normal game. This was a chance to get the teams together and see how teammates played together in game-like conditions. 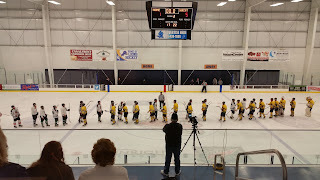 Instead of the traditional three periods of 20 minutes, the scrimmage was instead two 25-minute periods. Both squads seemed excited as the puck was dropped. The speed was much quicker than expected. By the end of the first 25 minutes of play the speed of play had dropped. During the second period, the speed had dropped to a pace that allowed both teams to settle in and tighten up their game. Lockport, while skating fast, got off to a slow start on the scoreboard. Southern Tier opened the scoring with a goal 3:44 into the period. They followed that up with a shorthanded goal at 6:16, and a third at 9:49. With just under four minutes left in the frame, Lockport’s number one draft pick, Aaron Shahin, was nabbed along with his dance partner from Southern Tier. The visitors then closed out the scoring for the period with a strike in the waning seconds. Southern Tier left the ice with a 4-0 lead and outshooting Lockport 13-9. The second period was played at a slower pace than the first, and it was a boost for Lockport. Their play selection was better, and they had far better chances than in the early period. Patrick Manning put Lockport on the board with a quick shot at 3:07. A penalty by Shahin a couple minutes later resulted in a power play goal by Jamestown to make it 5-1. That was the last goal of the game. Southern TIer finished the game outshooting Lockport 22-17. “Yeah. I liked the play of John Duffy and Nick Grupp on defense. Our forwards, Luca Mazzo and Ian Bressett played well for us, too,” added head coach Brian Becker. 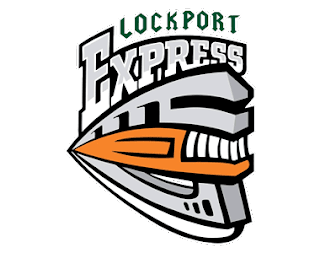 The Lockport Express will open their third season at home on September 9, 2016 against the same Souther Tier Express. Puck drop at the Cornerstone Arena for that game is at 8:00 pm. The game will be broadcast on Niagaraswatercooler.com, with Howard Balaban, George Root, and Craig Bacon calling the action.